Say goodbye to the smart-casual trend. Put your stilettos back in the wardrobe and reach for your trainers. For years, we’ve longed for a trend that puts comfort first — and it seems all those years of wishin’ have paid off! Now, we can step out in trainers, leggings, loose-fitting tees and even jogging bottoms all in the name of Athleisure, officially our favourite EVER trend. Yes, Athleisure is officially here! Of course, that’s not to say you can crawl out of bed, throw on our trackies and expect to look like Kate Moss. While the basics of this look are comfort classics, you’ll need to style it right to create the sports-luxe look.  A bomber jacket — HUGE in 2016 and set to be even bigger this year, the loose-fitting, bulky shape of a bomber is a must for creating this look. For a feminine look, choose fresh pastel shades. 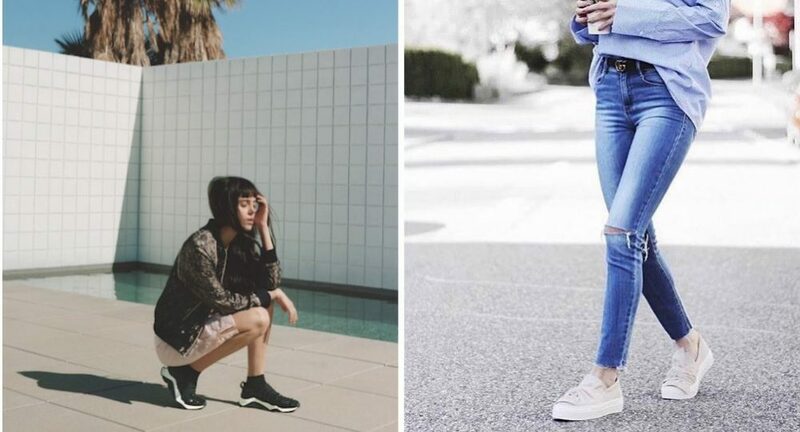  Trainers — forget heels, this trend is all about a great pair of trainers.  Leggings or joggers — we’re not talking your old gymwear here; invest in a pair of branded leggings or jogging bottoms that are tapered and cuffed for a close fit.  Sports tops — cropped tops and hoodies are perfect when paired with a pair of leggings or jogging bottoms and bomber jacket. If you’re not quite ready to show off your tum, opt for a loose-fitting sports jersey with mesh detailing. Mix and match a combination of these must haves to nail the ultimate sports-luxe outfit or work them into other outfits. For example, why not wear pair some Ash trainers with a flirty, feminine day dress? The juxtaposition will cement your status as the ultimate fashionista who is effortlessly conquering an eye-catching look.  Accessorise, accessorise, accessorise! — sportswear is generally quite plain, so make your outfit pop with jewellery. Think 90s throwback gold hoops and choker and delicate gold necklaces.  Wear a coat — one of the easiest ways to take your look from gym to street is to wear a coat. Whether it’s a loose-fitting, vintage-inspired denim or bomber jacket or a longer, open duster coat, they’ll add to your look on cooler days.  Cover your bum — if the thought of wearing leggings fills you with dread, tie a checked or denim shirt around your waist. Acting as a super-cool, bottom-covering skirt, it will tie in with your look without cramping your style.  Keep your workout clothes separate — if you are going to the gym, keep your workout wear separate to your Athleisure wear so as not to cross-contaminate fashion with fitness.